The question on the cover sets the main plot. Can Trix and her friends escape the Lime Green Ghost of Lincoln County? At first, I found the layout strange. The author chose to introduce each of the main characters in a separate chapter. Then he proceeds to explain Halloween customs in different countries. Finally, he gets to the subject of eggs and the plot that the five friends have hatched for this upcoming Halloween. 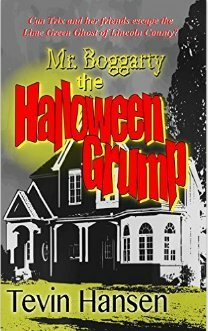 Last, bit not least he sets the scene with each of their customs and moves to Mr. Boggarty’s house on Halloween night. Trixie, Frank, Darby, Darren, and Preston crouch behind the tree in Mr. Boggarty’s front yard and prepare to ring the doorbell. When Darren “chickens out,” Trix cautiously turns the doorknob and the five friends find themselves inside. At first the house seems normal, but soon they see a lit jack-o-lantern on the table. Deciding to throw their rotten eggs inside the house, they are paralyzed with fear when the door slams shut and the lights go out. Suddenly the fifth-graders are confronted with a bright green flying ghost. He orders them to kneel down and informs them he has just stolen the soul of Mr. Boggarty. He gives them a history lesson about the Great Depression But the worse news is yet to come. The children have been selected to be the new Demons of Lincoln County; they will be sent to school to learn how to be ruthless, evil and diabolical creatures who prey on poor farming communities like the one they live in now. The ghost’s brothers and sisters will arrive at six o’clock to whisk them away forever. As a thunderstorm rages outside the house, the five friends await their fate. The plot has a ending with a surprise twist. Hansen takes his time building up to the main plot, but keeps the suspense going once the children arrive in the house. Middle grade students will enjoy the diversity of the characters, the humor, and the scary story line. Good choice for a Halloween party or a classroom read aloud. The dialogue is easy to read and the length of just over 130 pages is a good fit for reluctant readers. Thanks for sharing some about the book. My granddaughter would enjoy this book, she loves to read. Hope she decides to take a look at it….